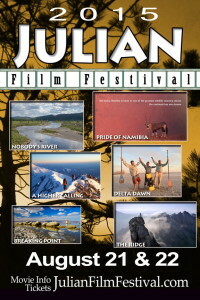 August 5, 2015 (Julian)--The 4th Annual Julian Film Festival, benefitting and sponsored by the Volcan Mountain Foundation, is moving from spring to summer for 2015 and will be held on Friday, August 21st & Saturday, August 22nd. An Emmy-nominated documentary, ‘Breaking Point’ by award-winning documentary producer Bill Wisneski, spotlights a critical water issue and a potential crisis in Southern California with the Salton Sea and the Colorado River Basin. San Felipe Creek springs forth high on Volcan Mountain and flows east into the Anza-Borrego Watershed and onto the Salton Sea’s Colorado River Basin. California’s largest lake is disappearing and time is running out to make changes before an ecological breaking point is reached. Certainly protecting watersheds and water sources like the Volcan Mountain Range is one part of the solution to this weighty issue. Another highlight of the festival will be the film ‘OR7-The Journey’, by filmmaker Clemens Schenk, that depicts the importance of wildlife corridors in Northern California/Oregon and the plight of grey wolves, and clarifies myths and misconceptions that surround these magnificent animals. The film documents the journey of OR-7, a grey wolf which was collared in Oregon and eventually dispersed from his pack. A journey that tells the story not only of OR-7, but of the wolf as a species in America. It is a journey of survival. 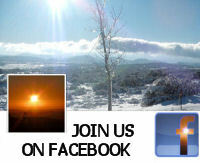 A journey of inspiration. Schenk shared that he lived in Julian about 40 years ago for several year in the house on Main Street that’s now the Julian Pie Company! He has fond memories of Julian, and looks forward to making the trek down for the festival. He’s making arrangements with supporters and colleagues from Julian’s own California Wolf Center and the Center for Biological Diversity to participate as well. Everywhere this film’s been shown it’s sold out, so don’t miss your opportunity to view this critically-acclaimed and fascinating documentary! The Julian Film Festival hopes to provide connectivity for those that love, and are hopeful for, nature and to serve as inspiration to inspire active stewardship for protection and care of vital natural resources like the Volcan Mountain Range. The film festival provides a fun, social opportunity to look at, share, and discuss important environmental issues as a community. It takes issues what may seem large and looming, and through spirited and social engagement gives hope that together we can (and must) tackle even the biggest issues that face society today. The historic apple-producing, ranching and gold-mining town of Julian, California in the mountains of northeast San Diego County, provides the perfect setting to get informed about, and inspired by, nature. Surrounded by the Cleveland National Forest, Julian also showcases natural attractions for recreating and camping like the nearby Cuyamaca Rancho, Palomar and Anza-Borrego State Parks, and several countyparks and preserves. The Festival will kick off with Friday night films at the Julian Station, a popular local food and watering hole and historic apple packing facility and cider house. Filmgoers can enjoy local, organic food and beverages from Mr. Manitas Taco Bar & Fruteria, The Cooler, Golden Coast Mead, and Julian Hard Cider before enjoying the films on an outdoor screen and a filmmaker reception to follow. On Saturday, there will be four 90-minute film sessions with community/filmmaker discussions to follow atJulian High School on the east-end of Main Street. Just a couple blocks away, the historic townsite of Julian offers ample dining, shopping and lodging opportunities. A Saturday night awards party at the historic Julian Town Hall with live music and food provided by Granny’s Kitchen will close out the festival. On Sunday, attendees staying for the weekend can visit VMF’s Volcan Mountain Nature Center and take a guided hike on VMF’s Sky Island Trail that provides a spectacular views to the coast and a terrific overview of adjacent watersheds and mountain peaks.